World Religion and Modern Art. 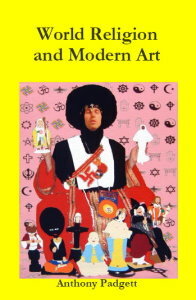 At last, here is a book that looks at a broad range of World religions (Christianity, Judaism, Islam, Hinduism, Buddhism etc) Modern art forms (Romanticism, Cubism, Surrealism, Abstract Expressionism, YBAs, Postmodernism etc) and artists. It analyses and gets to the heart of what constitutes religious art in a modern age. The book includes the work of art theorists (Benjamin, Greenberg, Debord, Bakhtin, Bataille, Sontag, Derrida) and over 120 key artists. £14.99.